Strong & malty. Foil sealed for freshness.What does it taste like? A bold, satisfying, proper cup of tea with a full-bodied, lasting flavour. Where does it come from? There are only two places in the world where tea plants are native. Assam in north-east India is one of them. We've been sourcing tea from gardens on the flood plains of the Brahmaputra River since 1838. You learn a thing or two in almost 200 years, like which leaves give the best flavour. 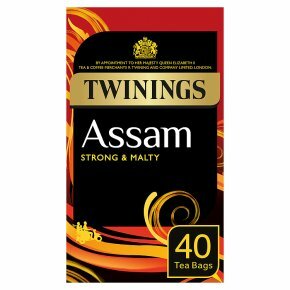 That's how we know our Assam contains only the best. (China's the other one, in case you were wondering). What makes this tea different? Our Assam leaves aren't picked until June because that's when they start making the best-tasting tea. Off-peak is just not the same. How do I drink it? Brew for two to three minutes if you like it strong. Longer if you're feeling brave. Add a splash of milk for a hearty cup of tea.